W Atlanta Downtown Hotel & Residences | AirTemp, Inc.
Starwood Hotels was building the 30 stories high W Atlanta Downtown Hotel & Residences in Georgia. The 30 story tower consisted of 15 stories of hotel, an amenities level and 14 levels of luxury residences. To take on a project this large, Starwood Hotels needed an experienced and capable mechanical and plumbing contractor. Comfort Systems USA (CSUSA) was ready to help. Juggled the complex installation of several mechanical and plumbing systems to meet varying usage needs throughout 30 stories. Coordinated and worked closely with the other trades to deliver results. Focused on visual aesthetics of systems to blend into the building’s luxurious environment. 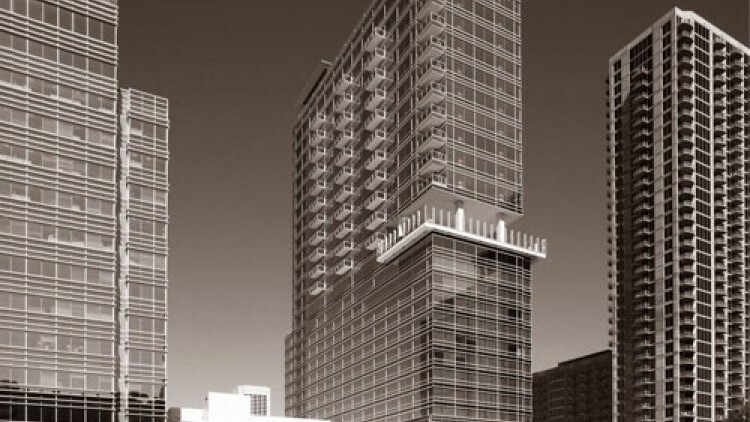 The CSUSA team started working with general contractor Hardin Construction Co. on the W Atlanta Downtown Hotel & Residences project in December 2006. CSUSA’s scope of work included the installation of two (2) 460 ton water cooled chillers, a two-cell cooling tower, chilled water and condenser water pumps, supply and exhaust fans, stairwell pressurization fans, and sheetmetal ductwork. Piping provides for a primary and secondary chilled water loop system serving: air handling units located on the 4th and 15th floors, roof top units, and several terminal units serving the public spaces. The hotel rooms are conditioned by chilled water units with electric heating. Ten (10) roof top units were installed to provide conditioned air to a ballroom, kitchens, hotel corridors and condominium corridors. The condominium units are served by individual split system units. A complete plumbing drainage and water distribution system was installed including a hot water recirculation loop for the hotel. Hot water is provided via two (2) gas fired boilers with two (2) 1500 gallon hot water storage tanks. Floors 1 through 4 of the hotel contain a full service restaurant, lounges, a ballroom, meetings rooms, banquet kitchen, and parking. Floors 5 through 15 contain 243 hotel rooms. Floor 16 includes a luxury spa, fitness center, and outdoor pool and bar area. Floors 17 through 28 contain 76 residences with the upper most residence level containing 6 two-story penthouse units.